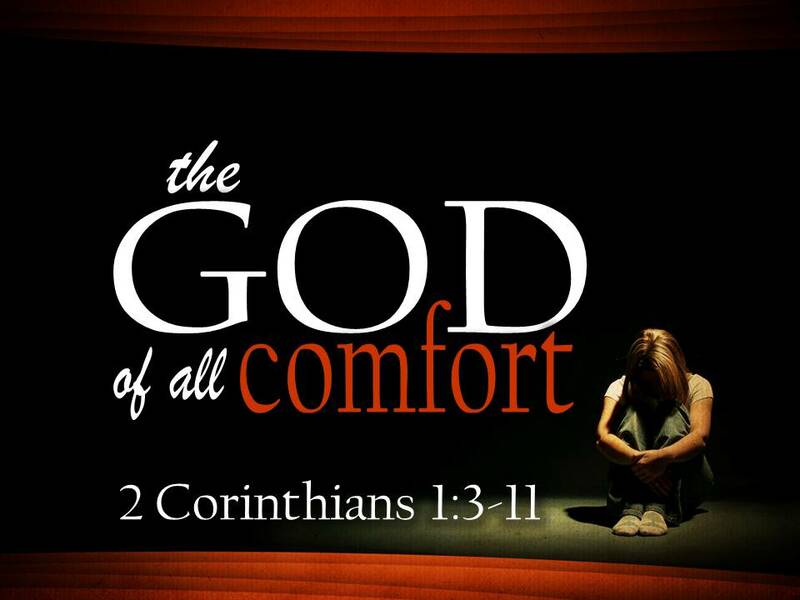 God of All Comfort | Joe Quatrone, Jr.
“Praise be to the God and Father of our Lord Jesus Christ, the Father of compassion and the God of all comfort, who comforts us in all our troubles, so that we can comfort those in any trouble with the comfort we ourselves receive from God. For just as we share abundantly in the sufferings of Christ, so also our comfort abounds through Christ” (2 Corinthians 1:3-5). What a marvelous title – God of all comfort! New Testament writers use the concept comfort repeatedly. It conveys the idea of encouraging and exhorting those who cope with defeat, doubt, and depression. Indeed, Jesus always stands next to His people with the pledge that He will never forsake them (Matt. 28:20). Although suffering is not eradicated, we have Someone who soothes us in the midst of it. Often we cry for temporary relief, but the God of all comfort gives permanent consolation in the midst of excruciating pain. Many think that when God comforts us, our troubles should go away. But if that were always so, people would turn to Him only out of a desire to be relieved of pain and not out of love for Him. We must understand that being comforted can also mean receiving strength, encouragement, and hope to deal with our troubles. The more we suffer, the more comfort God gives us. If you are feeling overwhelmed allow God to comfort you. Remember that every trial you endure will help you comfort other people who are suffering similar trials. Paul makes it clear that the comfort we receive from God is not for our benefit only, but also for sharing with other hurting people. Comfort is not found in the absence of pain, but in the midst of it. So many hurting Christians believe their walk with the Lord is not as it should be because of their intense pain. Feeling comfortable and being comforted are two entirely different things. The first is a nice feeling, but tends to come and go. The second is a fact based on the Comforter, not on circumstances. And the wonderful thing is He does not come and go: “I will never leave you nor forsake you” (Heb. 13:5). When we are hurt, the God of all comfort gets out either the gentle medicine or the stronger dose to heal our wounds. And the wonderful part is, He stays with us to comfort the pain. The God of all comfort, by the Holy Spirit, breathes comfort in the scrapes and wounds of life. Those who have experienced hurting or suffering know it gets tiring after a while. The weary saint cries out with Paul to remove the thorn in his flesh. The Lord Jesus Christ Himself also prayed for the cup to be removed. In fact, He was so physically and emotionally weary, an angel was sent to strengthen Him (Luke 22:43). Times of suffering are particularly difficult times, especially if the suffering has persisted. But it is precisely at these times the Comforter is the most precious. He is the Shepherd in the valley; the Father to His child; the Rock of ages; the Shelter in time of storm. This should encourage those who are in pain. The parents of a wayward child will mourn, but does that mean they are not comforted? No! Their parental heart might ache for years to come, but their regenerated souls will take great comfort that there is One who loves their child more than they do. The wife whose husband has abandoned her will grieve and mourn, but does that mean she is not a victorious Christian? No! The victory comes when she goes to her empty bed and realizes there is One who will never abandon her. She hurts, but her soul rests in One who is able to soothe her wounds. The husband who takes fresh flowers to a grave weeps uncontrollably when he remembers his wife’s smile. Are his tears a mark of spiritual immaturity? No! The tears are a mark of a man who dearly loved his wife. His heart breaks, but his soul rests in the Comforter who promises he will see his wife again. Peace is not the absence of pain. We would not be promised a Comforter – much less need One – if the Christian life was a life of unending bliss. The typical view of the Christian life is one of deliverance from trouble, but Scripture calls us to deliverance in trouble. I have learned an amazing truth amidst my struggles in life: I can have a pain in my heart and a settled peace in my soul at the same time. And so can you through the ministry of the Holy Spirit. The Comforter soothes in various ways – through Scripture, through music, through other saints (who have probably been hurt), and through other tailor-made ways that suit our particular struggles. God is wonderfully creative, perfectly matching comfort with sorrow. As a comforting Father, He gives strength to go on in the midst of pain. He is the perfect parent to His children! My prayer for you today is that you will feel the loving arms of God wrapped around you. He is saying to those who belong to Him, “Sweet hurting child, you are so special to Me. I hurt with you. I’m staying right here to take good care of you.” As He is blowing gently on the stinging wound, He is remaining close to His children. God’s peace is often unexplainable to someone who has not experienced it. In my life, the deeper the sorrow has been, the more indescribable the peace. So, the next time you tell someone about Christ, listen carefully to see where the brokenness is and how Christ can put that person’s life back together. God does not comfort us to make us comfortable, but to make us comforters. One of the many paradoxes of the Christian life is that the grace of God is most keenly experienced not in the best, but in what seem to be the worst of times. As much as a Christian longs for exaltation (1 Cor. 4:8), it is often in humiliation that he finds grace (2 Cor. 12:9). It may not always be well with my circumstances, my emotions, or my personality, but it is always well with my soul! This entry was posted in Topical and tagged Circumstances, Devotions, God, Grace, Holy Spirit, Hurting, Jesus, Peace, suffering. Bookmark the permalink. This is excellent, Joe. Just perfect. Well done once again! Thanks Rebecca. God bless and have a great day! For me this post is great encouragement. Thanks! Come to South Baptist Bay City, MI, Alas you probably have your own church already. You are a true man of God’s Word. What a testimony you have.!! Thanks. If it were not for the day I almost died, I would have never opened my eyes and wanted to turn my life around. I praise the Lord for being my refuge and comfort! I added this to my blog for today. So needed in my life right now. We need to bring comfort to the hurting, who do not know God, because it seems the world gets more and more hopeless! Great blog! thank you! Oh Joe. this is the most beautiful letter I have ever read. It brings me so much peace to know in my heart, that God is comforting me and my family during this painful time. Worry about the outcome and what will become of a child who cut her arm from elbow to wrist, is very stressful. But one thing I have found out during this waiting period, that the God of Comfort has brought this grieving family closer to Him and has made His presence known, where it would not have been. I told my daughter today, who has given me such joy, that where there is extreme sorrow, comes something good. God has come into my family and made His awesome presence known and has comforted us all. It is His gift of love and mercy and grace that brings this kind of comfort. There is no other that could comfort us in this way. My daughter has asked for prayers. We both have pleaded for prayers using ever resource at our disposal. He has answered our prayers and has changed what was a nightmare… into something greater than ourselves and God has become her first request for prayer. She knows the power of prayer now and has brought God into our life where He belongs. Thank you so much for prayers for Eva, my Grand Daughter who has given herself to Jesus. One day, a couple of years ago, I asked my Grand Son and Eva if they believed in Jesus Christ and loved Him and their answer was yes, Grandma. Fantastic Rita! The Lord works in mysterious ways to bring us to Him, which often involves some sort of crisis experience. As you say, “where there is extreme sorrow comes something good.” I thank God for His grace amidst of my difficulties. We truly serve an amazing God! Thanks Lindsay. God bless and have a great day! Joe, great post. I just spent 45 minutes in prayer crying out to God & happened to come across your post at the end of that time. It was very timely. Thanks Kerry. God bless and have a great day! Beautiful! Thank you so much for your comforting words. Thanks Kathy. God bless and have a great day! THANKS PASTOR QUATRONE. I NEVER THOUGHT ABOUT “GOD’S COMFORT” LIKE THIS BEFORE. YOU ARE SO RIGHT. WHAT A REVELATION OF TRUTH. I MUST SHARE THIS ON FACEBOOK AND ON MY BLOG. AND IT IS WELL WITH MY SOUL. GOD BLESS YOU! Thanks brother. God bless and have a great day! Thanks Ellie. I appreciate your encouragement and support. God bless and have a great day! It’s true we can have a pain in our heart yet a peace in our mind. It’s a truth that is hard to embrace when you are in the midst of suffering, but one we desperately need in those times. Thanks so much for sharing this. This is excellent! I may quote this prayer in my sermon next Sunday. God bless! You are welcome. I first encountered when a visiting priest used it as the dismissal. Thanks Tom! God bless and have a great day! Thank you does not seem enough Pastor Joe for such a Loving and comforting message, you do indeed have a Pastors heart seeking to bring comfort to those in your flock who are hurting, God bless you greatly for doing so. I cried as I read your words, they gave me heart assurence that we are comforted in our suffering . Thankfully we have the Body of Christ and we carry each others burdens and even cry with each other but as you shared we also rejoice in knowing we are not alone, Jesus our King of kings and Lord of lords is always with us. I know I have shared the Scripture below with you before Pastor Joe but It confirms your message so well and they are the words God gave me in my heart when I went through the dark storms life and I still hold onto them with thankfulness. Thanks to Anne for reblogging this. Words of love, faith and encouragement at a time when we all needed to be comforted and be healed. So much pain around us and reading these makes us hope that things will be okay. God bless. Thank you Joe for your article on Gods comfort. I was much impressed by it and you have highlighted an area which is not touched on lately. Its only Gods comfort that can give us peace and as the word says passes all understanding ‘I loved your line,’God doesnt comfort us to make us comfortable but to make us comforters. Hi Pastor Joe, it seems that Island Traveler left your comment on our Blog and mine on yours by mistake, I thought you might like to read it too. This particular post has blessed me today– I wrote a devo on the same passage not too long ago also in my “Day 11 – Something bigger than me” post. A poetically written post that reflects and sings with the lyrical poetry of God’s love toward mankind. Thank you for such a well-written post, Joe. Only the Christian God is such a personal God! Only the Christian God lives with all who profess Jesus as Saviour and Lord as our personal Comforter, who prays on our behalf and cries out to the Father on our behalf even when we are too downcast or weary to do so. I really like your paragraph about Jesus being comforted by an angel. Jesus knows all about suffering on earth because He suffered not only the ultimate sacrifice on earth, but also the mental and physical humiliation that came before, with, and after it. Isn’t it wonderful to think that the Comforter who comforted Jesus is the same Comforter who lives in our hearts? A truly encouraging post. Indeed, comfort and grace are more valuable in trying times. God of all comfort is reliable. A lovely and truly encouraging word, Pastor! There is a warmth and comfort that comes with knowing the Holy Trinity. I would be lost without them and was, not knowing they were waiting for me to turn to the truth in Jesus Christ that God gave us. The Son, the Father and the Holy Spirit have opened the door and I entered into their kingdom as we all do once we give our hearts and love to Jesus and His Gospel. I live in a different world now knowing that I am His. God bless all those who have lost a child. My heart and prayers go out to them. Great words indeed! Truly encouraging as I face difficult situations in my life. Thank you for stopping by my blog and liking my post. Thanks for commenting, Terry. God bless! Pastor.Joe defendly He is our comfort in the midst of every trial we are to go throught. Thank you fr the way you explained it. I know for a fact that my God comfort me when my son was in a coma, I felt His presence within me, I felt I wasn’t along, I felt His peace surrounding me, is something so real and beautiful. Thank you again, and I already post this message. Thanks Carmen. His comfort is wonderful!